I am very much an accessories gal. Not too much necklaces, earrings, bracelets, watches, but rings, YES! I love a big cocktail ring. It’s such an easy and super affordable way to spruce up any outfits. 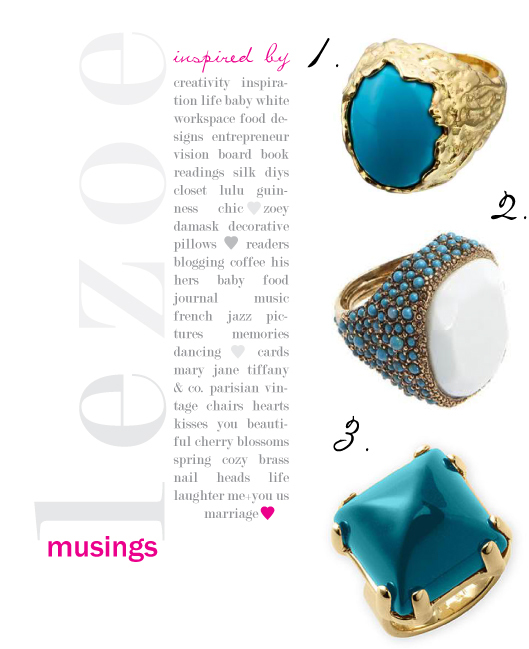 And to be quite honest, your hand just looks so much cooler when you wear a fabulous statement ring! That is the honest truth. With so many budget friendly style options out there, it’s a sin not to own any. I am all about gold tone jewelry now a days. Never a fan when I was younger but I got to say my style has been more refined and classier as I got older. I love the look of Gold & Turquoise together. Can’t think of a better color combo. I have a ring that is of this color combo as seen in the post Sunglass Case & More. It’s one of my all time favorites! I’ve been looking for rings! Where are the first two from? I am actually wearing gold and turquoise today! I love the color combo! I love each of them! One of my favorite combos.